This summer, I traveled with my family on a camping trip to the Bandon area of the Oregon coast. It was cold and windy, which is not unusual there but it was a refreshing break from the heat where I live. On the first evening after setting up camp, we were eating dinner in town. 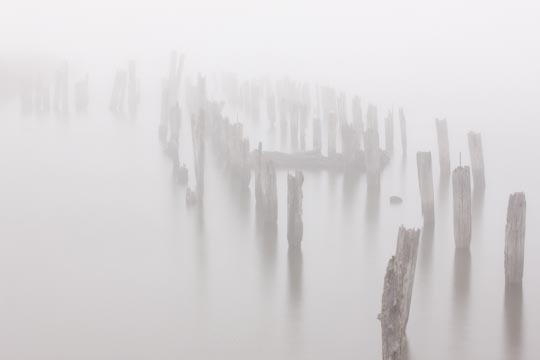 A thick fog had rolled in along the Coquille River, and I noticed these pier pilings mysteriously appearing and disappearing in the mist. After dinner, I spent nearly an hour photographing these piers. When composing this image, I wanted to show both the ethereal foggy mood and the depth of the posts fading out into the mist. I shuffled my camera position until I found a good rhythm of spaces between each line. This spacing accentuates the fascinating graphic structure because each space defines a post, and avoids the merging of that shape. For this image, I used the Singh Ray Vari-ND to lengthen the exposure. This technique does a great job of simplifying the overall image since the blurring “washes away” the textures of the water. To me, this heightens a feeling of the piers floating in space. 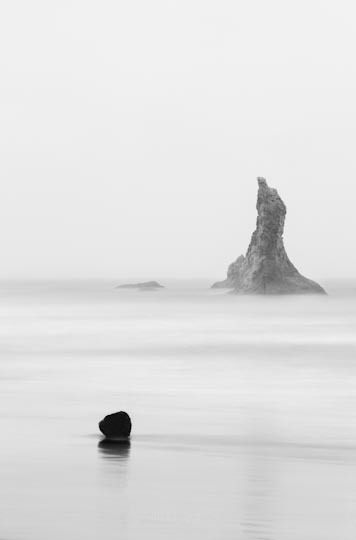 For the next two evenings, I was on the main Bandon beach, photographing in the wind and fog. Heaven! For some reason, very few others were enjoying the wintry conditions! I spent over one hour with my feet nearly freezing in the surf. In order to heighten the misty conditions, I had to get out into the surf wash for that “blurred water” effect. The wave action kept moving my camera, with the tripod feet sinking into the sand. I finally found a high spot where my tripod was relatively protected and my camera angle still included the surf. Since every wave picture is different, dependent on timing and action, I made dozens on frames to capture the best moment. For the image above, I used a Singh Ray Vari-ND to get more blurring action. There were some subtle tones in the sky, but the monochrome evening lent itself to Black and White. I particularly enjoy the textures in the surf and rock formations in this image, but mostly importantly how this image conveys the mystical mood I felt on this beach. The subtleties are hard to see at a small scale, but a large print will bring out the delicate, high key qualities. Even though I did not see spectacular clouds, or a dramatic sunset while at the beach, I made the best of what nature offered me. What did you do on your summer vacation? To see more on William Neill’s Black and White photographs, see his ebook Meditations in Monochrome. His newest ebook is William Neill’s Yosemite: Volume One. Bill, you’ve inspired me anew, yet again! Thanks Carol. You are really dating our ages with those workshops! But they were great fun!! !